The giant Kauri once seen everywhere in the North Island forests is now a tourist attraction when a mature specimen is found. Agathus comes from the Greek - a ball of thread alluding to the trees almost globular cone. They are an upright straight trunked tree with bronze green, lanceolate, 5 to 10 cm leathery foliage. Kauri does not make a good bonsai subject but there seems to be some fascination with trying to dwarf this forest giant. If you would like one for your collection you should be prepared for a long wait and a few disappointments. 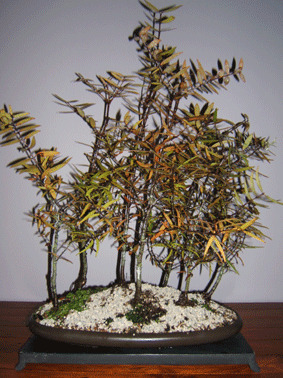 Kauri as a bonsai should be started from a seedling. They don't reduce well,when a branch or the tip is removed they produce a latex that can become unsightly. The roots are not very fibourous and take a long time to become so. The tree is therefore prone to being blown over in the pot if it's not wired in. As a group planting however they can become quite attractive with time. Kauri grow reasonably quickly while young and only slow down when more mature. They prefer a heaver soil so I add a little crushed dry clay and a little well rotted horse manure if available. Pinching of the tips helps to encourage branching, if this is not done the tree will grow straight up, with very few low branches. I have heard of Kauri being grown as an indoor plant, I have not tested this theory but if correct it may be nice as an indoor Bonsai. Kauri are very resistant to pests and diseases, the only problem they seem to get is a little black spot on the leaves. This can be controlled with the application of fungicide in autumn and early summer. If you don't want to muck around with different chemicals I would recommend "shield" spray it contains both a fungicide and insecticide and is safe on most plants. The only plant I have come across that will not tolerate systemic sprays is the Chinese elm Ulnus parviflora stick to the two brick method of pest destruction on this plant.